The Turnagain nickel property is situated immediately north of Turnagain River near its confluence with Hard Creek. The community of Dease Lake, on highway 37 some 400 kilometres north of the port of Stewart, is 70 kilometres west of the property. Helicopter access from Dease Lake involves a 20 minute flight. A secondary road extending easterly from Dease Lake has been used by large, articulated 4-wheel drive vehicles to convey large jade boulders from the Kutcho Creek area and to supply placer gold operations at Wheaton Creek over the past number of years. A branch of this road network extends into the Turnagain property; road distance to Dease Lake is about 100 kilometres. A 900 metres long dirt airstrip, constructed in the 1960s and situated within the claims area on the north side of Turnagain River, can accommodate small aircraft. This airstrip is immediately adjacent to Hard Creek's current camp facility. Previous exploration programs have made use of camp facilities at Wheaton Creek (Boulder) which is about 15 kilometres by road west of the property. Dease Lake has three times a week scheduled airline service and offers some supplies and services. The communities of Terrace and Smithers in B.C. and Whitehorse in Yukon, are all several hundred kilometres distant and offer the best range of supplies and services which can be trucked to Dease Lake via highway 37. Drills began turning again at Turnagain in July 2018. The program was designed to provide infill drilling over the previously defined resource and to explore some very promising geophysical anomalies at the northern end of the property. On October 30th, the Company announced that it had completed 10,835 meters of drilling in 40 holes. The infill drilling program was conducted with two skid-mounted drill rigs in the Horsetrail and Northwest zones. Although these drill holes provide valuable additional geological and resource modeling information, their primary purpose was to collect material of appropriate characteristics for future metallurgical testing. The Turnagain Nickel property covers the known extent of a zoned, Alaskan-type ultramafic intrusion, which measures 8 kilometres by 3.5 kilometres and is elongate in a northwest direction, conformable to the regional structural grain. The ultramafic body is in fault contact with Paleozoic to Early Mesozoic graphitic sedimentary rocks along its northern and eastern margins. The southern contact is not exposed, but several drill holes have penetrated the contact and intersected deformed, graphitic phyllites in fault contact with the ultramafic sequence. Partially digested inclusions of phyllite are also found within the ultramafic body and are abundant in the sulphide-mineralized zones, which suggest the inclusions locally control the nickel sulphide mineralization. Sulphur and lead isotopes from sulphide separates indicate that some crustal sulphur was added to the magmas which formed the Turnagain intrusion and that these inclusions led to the precipitation of sulphides from the melt (Scheel, 2007). The above technical information and all the other technical information on this web-site pertaining to geology and drill hole data is under the supervision of Mr. Greg Ross, P. Geo., a Qualified Person consistent with policy NI 43-101. In September, 2004, Aeroquest Limited conducted a 1,870 line-kilometre helicopter-borne geophysical survey, centred on the Turnagain ultramafic intrusion but covering a 31 kilometre strike length of prospective claims. The survey employed Aeroquest's AeroTEM II time domain electromagnetic system in conjunction with a high-sensitivity cesium vapour magnetometer. Flight lines, nominally 200 metres apart when located outside of the Turnagain intrusion, were decreased to 100 metres spacing within the ultramafic and locally, in areas of particular interest, to 50 metres apart. Results from the survey are illustrated in the two accompanying images. The Turnagain ultramafic intrusion is represented by a very strong, oval shaped, 3 kilometres by 8 kilometres magnetic anomaly with well defined margins. The intense magnetic response results mainly from fine grained magnetite associated with the serpentinization of dunite but with some contribution from cumulus magnetite, especially in the southwest portion of the anomaly. From the drilling done to date, a strong magnetic response is interpreted to indicate the presence of favourable ultramafic rocks, but there does not appear to be a correlation between intensity of magnetic response and sulphide mineralization in the Horsetrail-Northwest-Hatzl area. The source of the irregularly shaped, magnetic anomaly located immediately northwest of the Turnagain ultramafic has not been explained by limited surface work but is a target for future drilling. The electromagnetic survey was designed to detect conductive sulphide horizons within the generally non-conductive ultramafic intrusion. The intense conductivity in the sequence of phyllitic rocks surrounding the ultramafic intrusion is related to graphite and pyrite on bedding and foliation planes and is of limited exploration interest. Of greater economic interest are the conductors located within the ultramafic intrusion along its southwestern contact and, to a lesser extent, close to the northern contact. Drill holes, located in the conductive Horsetrail and Hatzl areas, intersected a number of narrow conductors comprising net-textured to massive pyrrhotite-pentlandite, graphite veins and seams, various combinations of sulphide-graphite-magnetite and sulphide-bearing, hornfelsed inclusions. All these discrete conductors were often hosted in weakly conductive dunite and wehrlite mineralized with intercumulus pyrrhotite-pentlandite and intergranular graphite. Drill testing of the conductive zones extending northwest from the Horsetrail area and in the northern portion of the ultramafic intersected net-textured pyrrhotite and graphite-rich intervals, usually without the wide intervals of intercumulus pyrrhotite-pentlandite mineralization so prominent in the Horsetrail-Hatzl areas. Several of these conductive areas remain prospective for nickel and platinum-palladium mineralization. Net-textured pyrrhotite was intersected in a recent drill hole in the Cliff area, but additional drilling is required to explain the sources of the numerous electromagnetic conductors. When Hard Creek geologists noticed strongly anomalous analytical results for copper, nickel, platinum and palladium in samples from several 2003 reconnaissance soil lines, the decision was made to cover the Turnagain ultramafic with a systematic soil survey. Beginning in 2004, soil samples were collected at 50 metre intervals along lines oriented north-south and spaced 200 metres apart. Sample density was increased in anomalous areas with infill lines on 100 metres, locally 50 metres, centres and samples collected every 25 metres. Samples were sent to Acme Analytical Laboratories in Vancouver where a 15 gram sample was leached in hot aqua regia and analysed by ICP-MS for an extensive suite of elements including Ni, Cu, Co, Pt and Pd. Reference pulps and duplicate samples were included with sample shipments as part of the QC/QA program. Data was processed by Colin Dunn, PhD., P.Geo., consulting geochemist. The majority of the nickel values in the broad arc of anomalous nickel covering the northern portion of the ultramafic intrusion is probably derived from nickel in the silicate mineral, olivine, and is not directly related to nickel sulphide mineralization. The olivine rich dunite is well exposed and underlies much of this anomaly. In the vicinity of the Horsetrail deposit, the discrete nickel anomalies are often associated with sulphide rich outcrops or concentrations of rusty weathering, sulphide bearing boulders, but the locally thick overburden has likely interfered with the development of a more continuous soil anomaly in this area. Two strong copper-in-soil anomalies occur 2.5 kilometres northwest of the Horsetrail mineralization. The larger of the two anomalies measures 1520 metres by 1080 metres and is separated by 200 metres of lower copper values from the second copper anomaly, which measures 920 metres by 640 metres. The larger copper anomaly overlaps a significant platinum-palladium soil anomaly, with platinum plus palladium values between 41 and 328 ppb in the core of the anomaly. Drill holes on the eastern and southern flanks of the platinum-palladium anomaly (DJ-DB Zones) have intersected platinum-palladium mineralization associated with chalcopyrite in magnetite clinopyroxenite. For example, hole 05-88 intersected 0.96 grams/tonne combined platinum and palladium across 49.3 metres and, more recently, hole 07-211 intersected 0.90 grams/tonne combined platinum and palladium across 36.0 metres. Additional drilling will be necessary test the rest of the soil anomaly and to determine the extent and significance of the platinum-palladium mineralization to date. The limited drilling and sampling in the platinum-paladium soil anomaly, located northeast of the DJ-DB anomaly, has not explained the source of the anomaly. 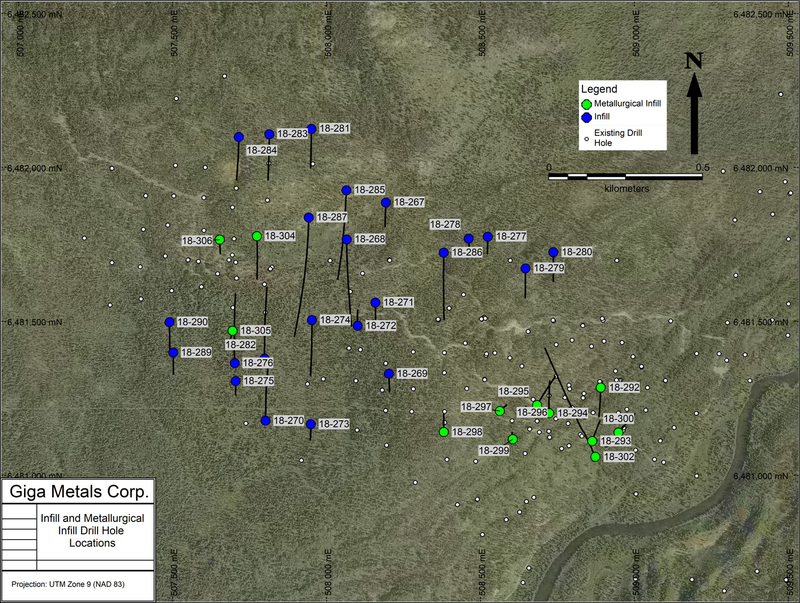 Hard Creek Nickel completed its 2007 core drilling program in early November and received the final analytical results in mid-February 2008. Drill collar locations are shown on the map with analytical results for the 75 hole (24,900 metres) program discussed and tabled in the following news releases. August 13, 2007; Hard Creek drills 292 metres of 0.28% nickel. September 25, 2007; Hard Creek drills 120 metres of 0.33% nickel. November 28, 2007; Hard Creek drills 0.70% nickel with 0.48g/t Pt+Pd over 8.0 metres. December 19, 2007; Hard Creek Nickel intersects 20 metres of 0.24% Ni and 0.60 g/t Pt+Pd in new discovery area. January 14, 2008; Hard Creek drilling expands on platinum and palladium discoveries. February 29, 2008; Hard Creek drills 64 metres of 0.47% nickel. The 2006 drill program consisted of 68 diamond drill holes for a total of 19,122 meters. The objectives of the program were to explore further areas of the ultramafic intrusion and secondly to expand the current resource. This last phase of drilling resulted in the discovery of two new areas of mineralization, the Hatzl and Duffy, and provided additional testing of the Highland nickel area, originally discovered in 2005. 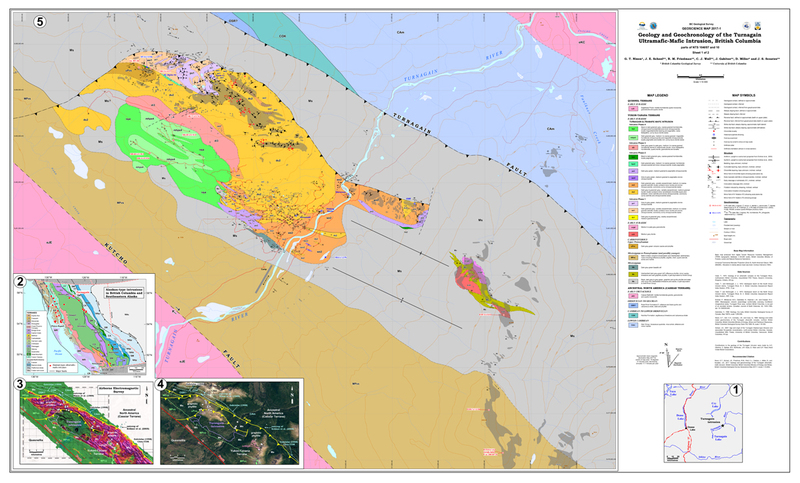 The mineral resources of the Turnagain deposit were classified in accordance with CIM Definition Standards and Best Practices referred to in Ni 43-101 and which have a reasonable expectation of economic extraction. Resource estimation was constrained by three-dimensional domain models developed from geological and analytical data. Block size for the estimation was 25 metres east x 25 metres north and 15 metres high. Drill hole analytical results were composited into fixed-length 15 metres down-hole composites. Analytical samples from drill core were generally two metres in length (prior to 2006) and four metres in length (2006 and 2007) of split NQ-size core. Reference pulps with known nickel values were inserted every 25 core samples and duplicate pulps prepared every 30 samples to monitor laboratory performance as part of the quality control/ quality assurance program. Total nickel and cobalt values were determined by ICP emission spectrometry following four-acid digestion of a representative pulp sample. All analytical work was conducted by Acme Analytical Laboratories Ltd., an ISO 9002 accredited facility. Check analyses, on ten percent of the samples, were carried out at ALS Chemex and IPL Ltd., both ISO 9001:2000 accredited facilities located in Vancouver. A detailed discussion of the resource estimation is given Turnagain Nickel Project, British Columbia, NI 43-101 Technical Report on Preliminary Assessment by AMEC Americas Limited with an Effective Date of 25 September, 2007.